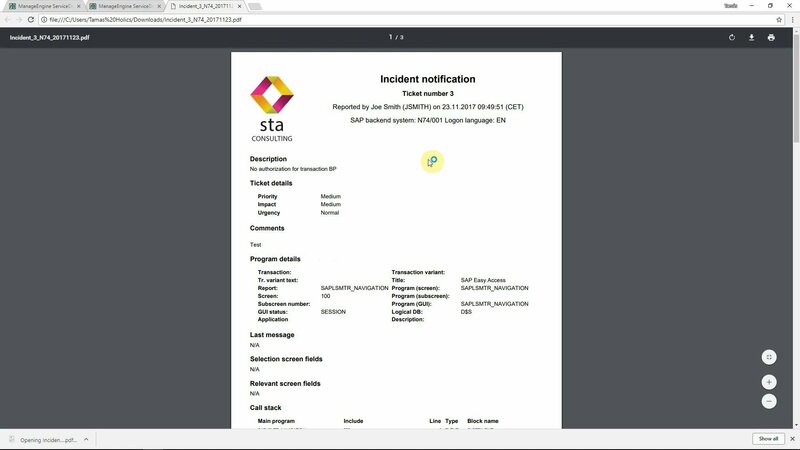 Learn how effectively you can connect your SAP and ManageEngine ServiceDesk Plus systems using STA Ticket System. The most prominent benefit of this process is that all technical and business information is attached to all requests created by SAP end users. This provides tremendous value for your support staff and helps them solve problems much faster. 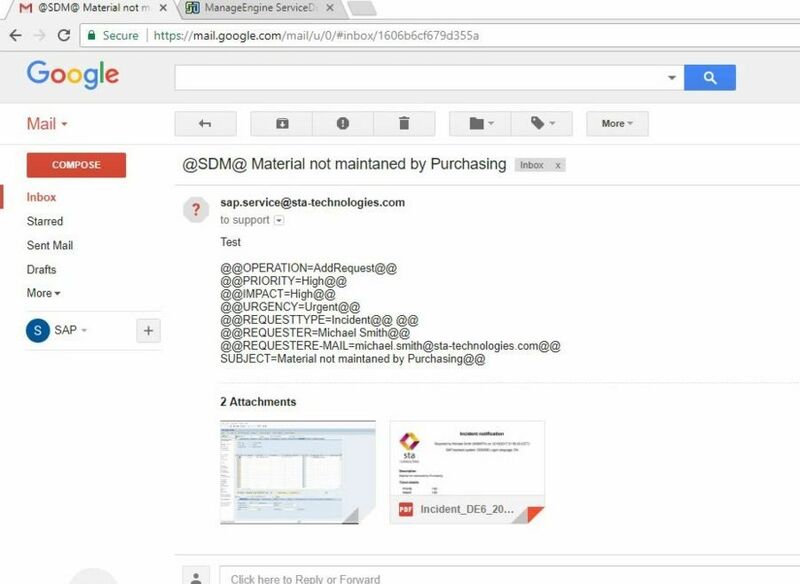 This post will show you the integration using both Email Commands and the REST API of ManageEngine ServiceDesk Plus to create requests. 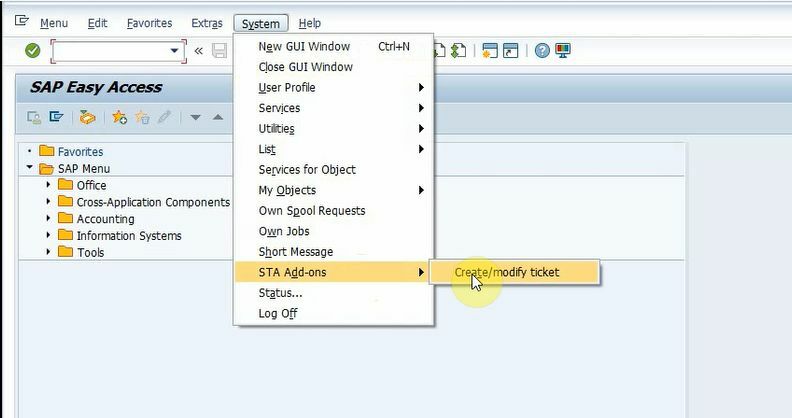 What is STA Ticket System? It is an add-on for SAP systems that must be installed on the SAP application server. 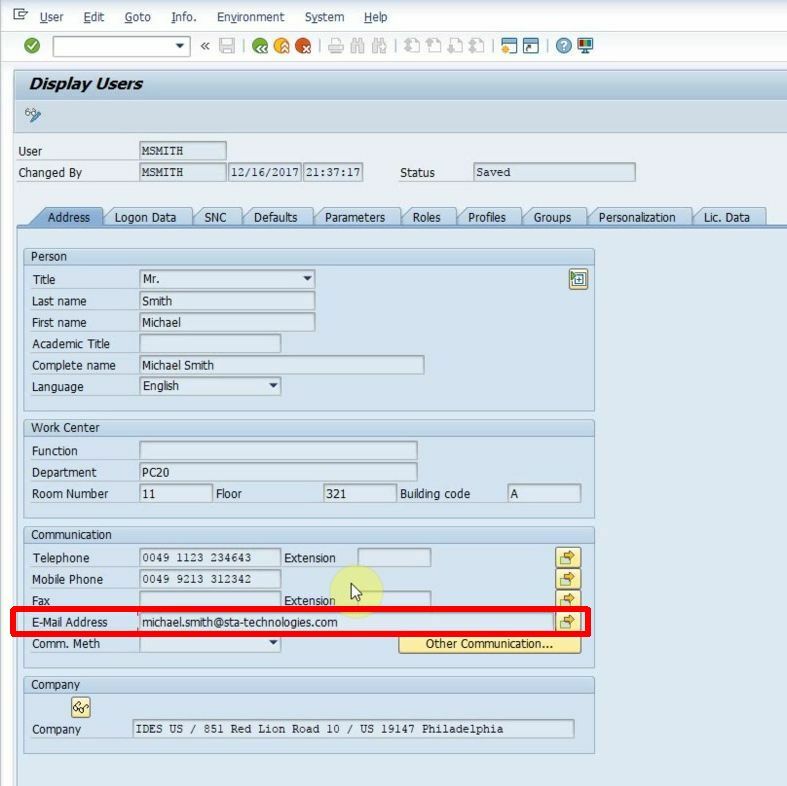 It extends the SAP GUI with a menu item that allows users to report errors directly from the screen where the error happened. 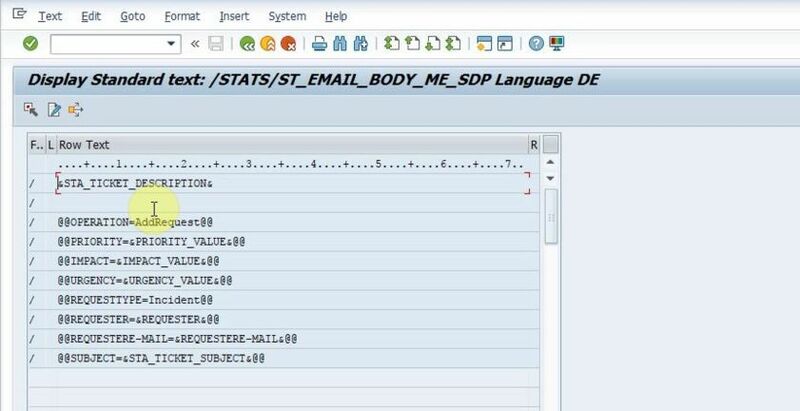 It works with R/3 based SAP systems that use the SAP Netweaver platform (for example SAP ECC, SAP BW) and the latest S/4 HANA systems as well. 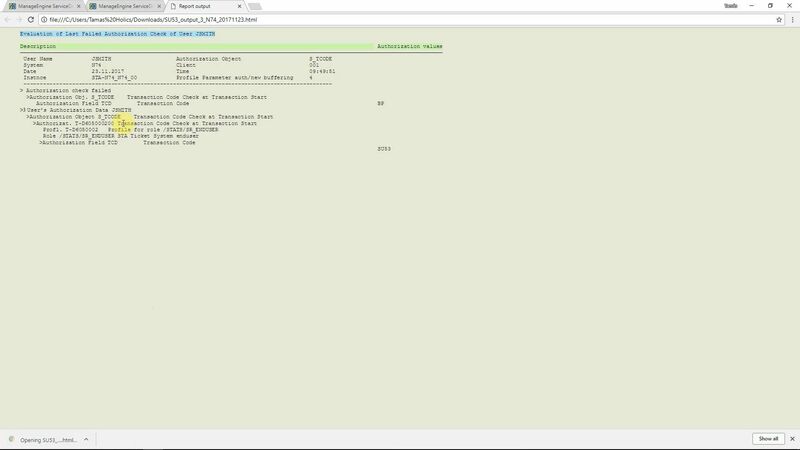 STA Ticket System can be launched from the transaction where the user experienced the error by simply using the System menu. The next step is to enter a description of the problem on the main screen and fill the ServiceDesk Plus fields which are displayed. The bottom part of the screen can be customized to match your requirements so you can include all your custom fields. Press “Send” when finished to create the Request in ServiceDesk Plus. The program will gather all relevant information about the SAP system, SAP user and currently running program and attach them to the generated request in ServiceDesk Plus. It will also attach a screenshot, an authorization report for the current user and optionally a shortcut to the problematic transaction. All this essential information provides a lot of value to the service desk staff. There is no need to contact the requester for every missing detail in order to be able to start solving the problem. This can save days of waiting for clarification for multinational companies especially if the support team is on an other continent. 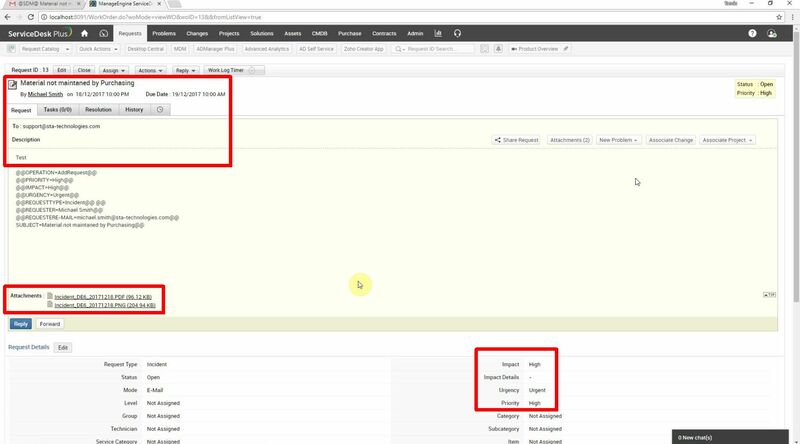 The REST API of ServiceDesk Plus provides web services that can be called from our ABAP add-on product. This requires practically no configuration in ServiceDesk Plus and very little on the SAP side. You have to install an SSL certificate of your ServiceDesk Plus server in transaction STRUST and set up an RFC destination to the ServiceDesk Plus server. 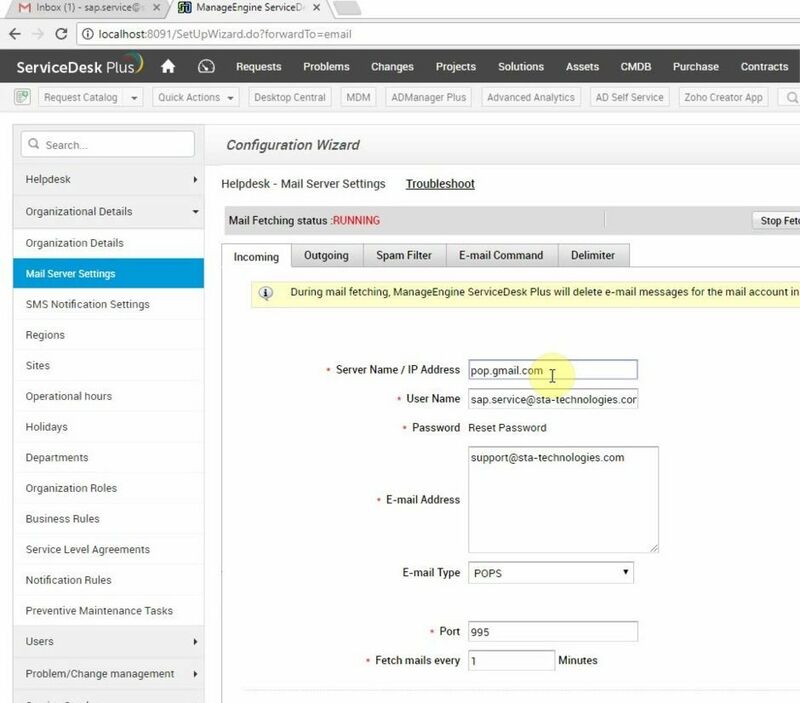 ServiceDesk Plus can convert incoming emails to requests, which is a great feature that allows a simple integration. The standard SAPoffice module is used for sending emails to a support address specified in a configuration transaction. 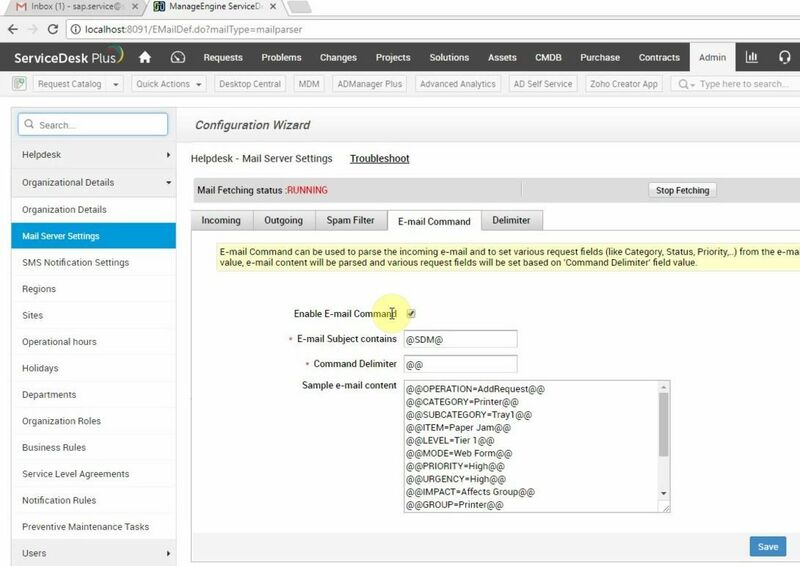 That mailbox is polled by ServiceDesk Plus in regular intervals (every 1-2 minutes) and if an email arrives with a specific format, an Email Command will be executed. This Email Command will parse the incoming email and can populate the request fields, short and long description and add all attachments of the email to the request. Email Commands or REST API? 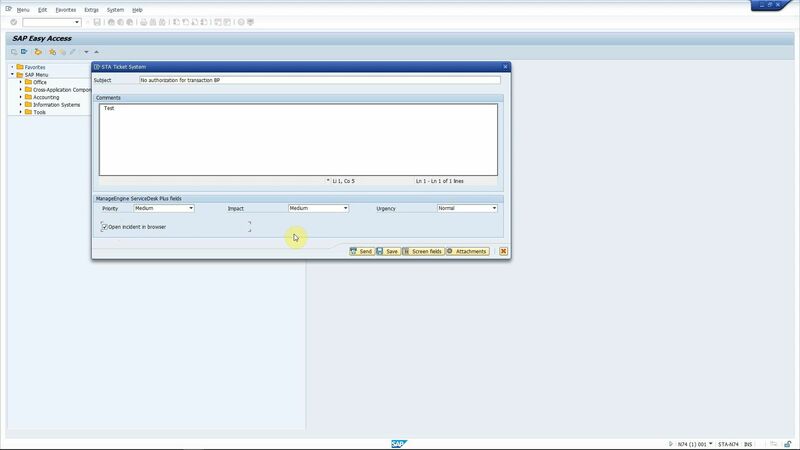 You can use both methods to create requests from SAP systems. It mostly depends on your existing service desk processes and infrastructure whether you should go with REST API or Email Commands. 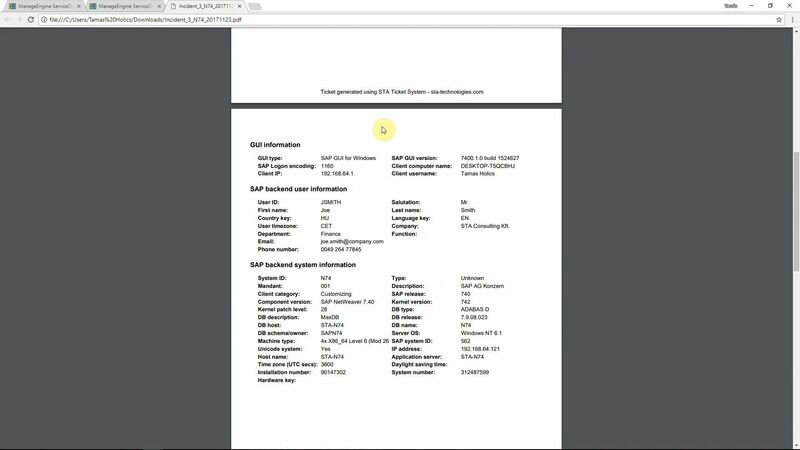 Choose Email Commands if you don’t want to enable the REST API or if it is hard to make a connection from the SAP systems to ServiceDesk Plus (firewalls, SSL certificates etc.). Using SAPoffice to send emails also makes storing all requests as outgoing emails possible, which is good for reference. 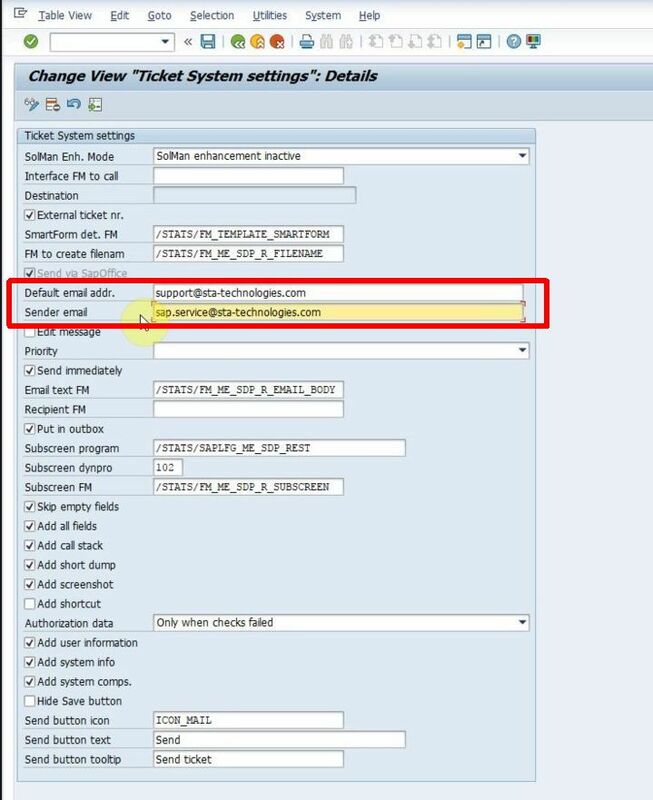 A drawback of using emails is that the end user may not get an immediate error message if the request cannot be created, because the request may be created a few minutes after submitting it in SAP. 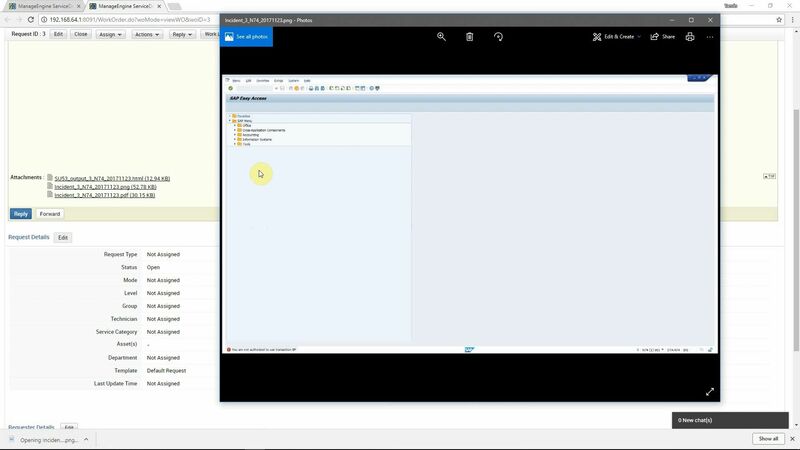 Choose the REST API if you want to use a fast and modern interface or if you do not have SAPoffice set up, which is required for sending emails from SAP. Additionally, users can immediately get a feedback if the creation of the request was successful or not. As a third option, you can create requests by sending them as an email to a specified support desk mailbox (like [email protected]) and then technicians can process them. They may decide to create a request from it (either manually or by forwarding the email to another mailbox monitored by ServiceDesk Plus to execute Email Commands) or classify it as user error and reply to the email. 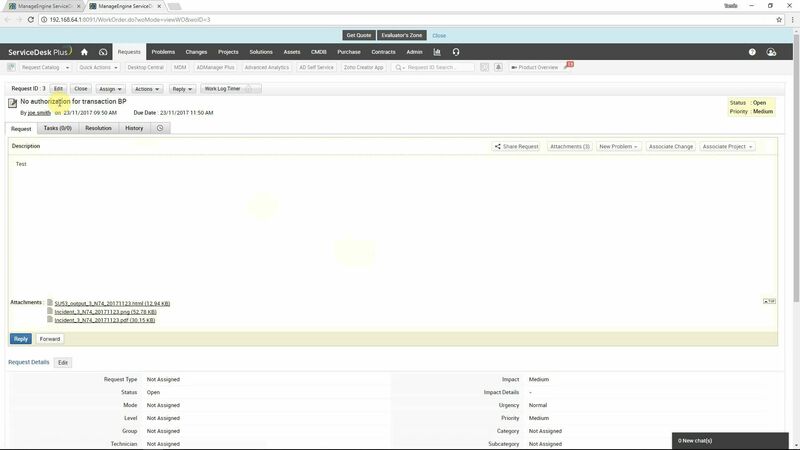 This is the approach which keeps your existing processes in place, so SAP users can’t create requests in ServiceDesk Plus directly. You can customize the main screen to have all request fields used in ServiceDesk Plus. You can also implement any kind of business logic you need, like filling fields with default values, make filling of fields obligatory or hide and display fields based on conditions. We deliver a template that can be used out of the box. If you want to change that, simply copy and modify it to add your own business logic. Your inhouse ABAP developers can implement this or we can provide consulting services to implement everything you need. Because all information available in all requests that are created, ticket resolution times can be significantly reduced. Also, because it is much faster to report an error, your SAP users do not have to spend that much time on reporting errors, which saves a lot of their valuable working time. All these benefits provide a significant reduction of SAP maintenance costs and other indirect benefits like less system downtime and job satisfaction. Our SAP add-on is listed on the ManageEngine Marketplace as “SAP for ServiceDesk Plus Connector“.